I love this smoothie as a midday snack – something to fill the void and keep me going until it’s time to break for lunch. If however you’re someone who needs a little kick in the pants to get up and go then this smoothie is for you. 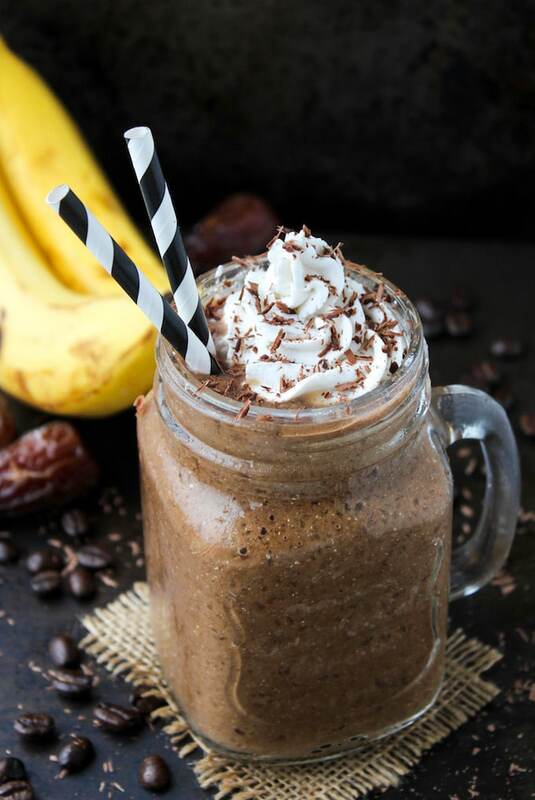 It’s naturally sweetened with banana and dates, so you’re at least you’re getting a little fiber to balance out the natural sugars. Speaking of fiber – this recipe also calls for chia seeds for extra doses of fiber, antioxidants, protein, and healthy fats. Are we feeling healthy yet? You do need cooled coffee to make this, so I recommend brewing a little extra in the morning so that it’s cooled and ready to go. If you’re extra organized and want this as your morning coffee replacement then make a pot the night before and store it in the fridge to be ready in the morning. And if you’re feeling extra decadent, then I’d definitely recommend that you commit to the indulgence and top it off with a dollop of coconut whipped cream. And chocolate shavings. Chocolate shavings are always a good idea. Add all of your ingredients to a blender and process until smooth. For a sweeter tasting smoothie add 1-2 more dates.